On Sunday, April 14, Robert Lucas returned to his ancestral home in Cambodia with two boxes full of children’s books, the latest donations from Judith’s Reading Room. 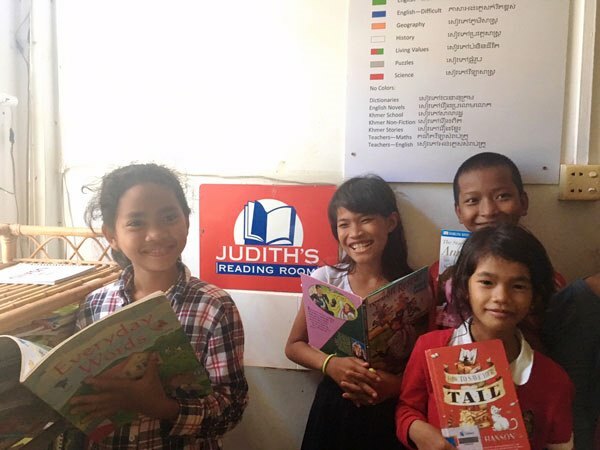 On Saturday, May 4, Judith’s Reading Room dedicated two libraries in Cambodia. The first library of 76 children’s books in English was dedicated in collaboration with A New Day Cambodia, a nonprofit in Phnom Penh that provides food, shelter and education to more than 100 scavenger children either abandoned or forced to pick trash to help support their families. At A New Day Cambodia, children are taught English to increase their opportunities for securing a job, particularly in the tourist industry. The second library was inaugurated at Anjali House, located near Angkor Wat, home to the famous Buddhist pagoda in Siem Reap. Anjali House serves 110 children between the ages of 4-18, who come from families so poor they are forced to beg on the streets. Anjali House will receive a custom collection of 87 books ranging in topics from photography to football to science. The books, 163 in all and written in English, include titles such as Green Eggs and Ham, If You Give a Pig a Pancake and A-Z Picture Dictionary, were given to these two organizations that rescue children from the streets and garbage dumps of one of the poorest countries in the world. Cathy Leiber, cofounder of Judith’s Reading Room met Lucas during a trip to Los Angeles last year where he was working at The World is Just a Book Away. She was looking to expand the organization’s presence in Asia and Lucas offered to personally deliver the books this month when he moves home to care for his grandfather. “Growing and expanding international collaborations based upon common goals to foster an appreciation of books, and the pleasure of reading, has the potential to create a positive impression of Americans in Cambodia and promote world peace ,” says Leiber.